It is time to get on the plane and fly back to Kathmandu. I am flying to Bangkok tomorrow and will continue to Kathmandu on friday. Two months in Norway has passed quickly. The next four months will I spend in Nepal. The first two months will I be up in the beautiful mountains in Himalaya. I will attend a Mount Everest Expedition. This is my first attempt to summit an 8.000 meter in Himalaya. I am looking forward to do this. People ask me if I am excited or nervous. My answer is no. So far do I feel very peaceful about what lies ahead of me. I am just looking forward to go back to the big mountains in Himalaya where I LOVE to just be and souk in all the impressions with my body and soul. It is strange to think that it is under a year since I decided that I wanted to try to summit the highest mountain in the world. I can not explain why I want to do it. It just feel right to go on this expedition. I know there will be moments up in the mountains, where I will wonder why I made this decision. But I know that most of the time will I LOVE to be there. My intention is off course to reach the top. If I do not succeed will I at least be one experience richer. I think if you first have decided that you want to climb this mountain, is it difficult to get peace in your mind before you have tried. Things happens fast and I change my mind pretty fast….. In october 2012 was I on my first trek in the Mount Everest area to Everest BaceCamp. 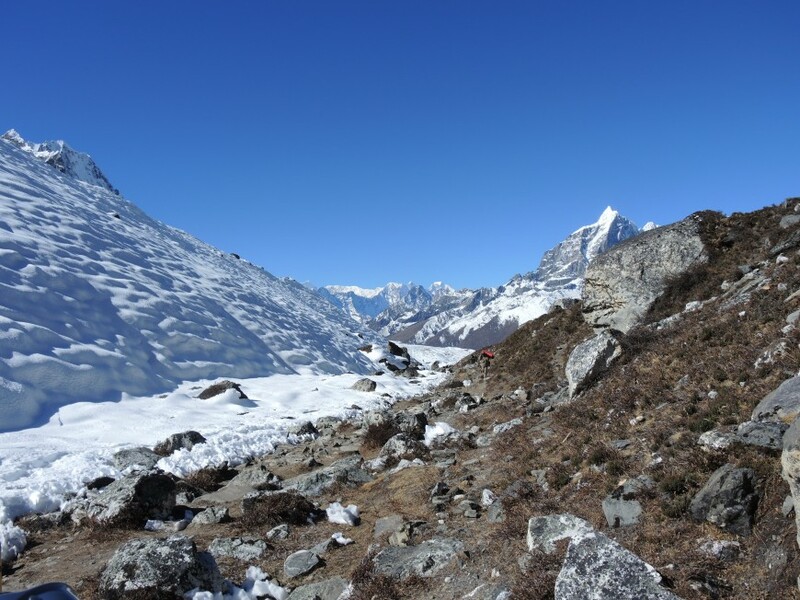 I was so sick when I arrived at BaseCamp, and I was quite sure that this trek would be my first and also my last time at Everest BaseCamp. 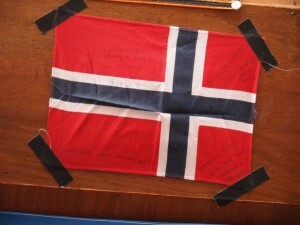 My friend Merete had brought a flag that we hung on the ceiling. 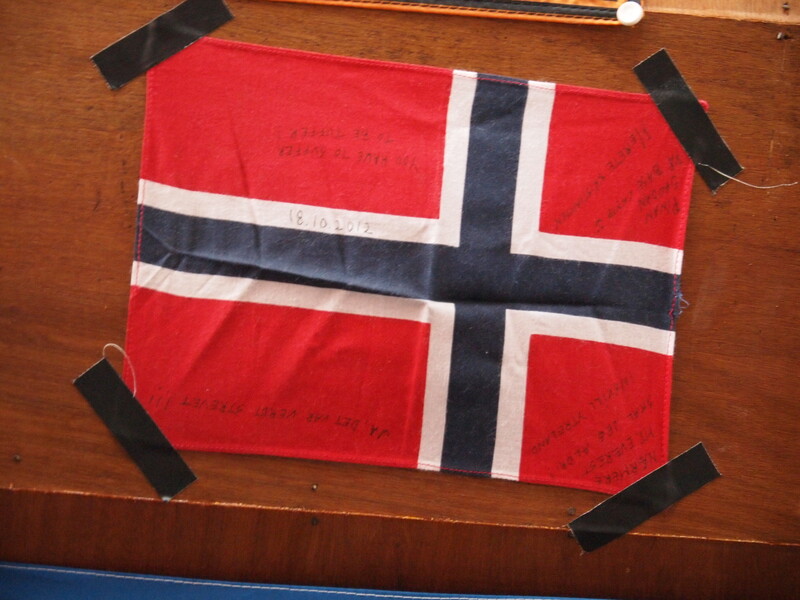 On the flag wrote I in Norwegian “Closer to Everest SHALL I never get….”. It is 18 months since we put up the flag in the ceiling in one of the lodges in Gorak Shep, and I have learned that I will never say never again. I do not think I will get a lot of sleep this night. As usual do I expose the packing until the last minute. No exception this time. I really to not like to pack my luggage. But I forget quite fast how boring it is.